At Creamer's Refuge, wildlife and people share the forest, wetlands, ponds, and open fields. Creamer's Refuge protects and enhances quality habitat for a diversity of wildlife, especially waterfowl and other migratory birds, while also providing for compatible public uses, such as wildlife viewing, research, and nature education. During the gold rush at the turn of the century, Belle and Charles Hinckley brought three cows and some horses from Nome up the Yukon and Tanana Rivers to the small outpost of Fairbanks to operate a dairy. They paid for their passage on the sternwheeler by selling milk to other passengers. On the last leg of the journey, they met and became friends with the Creamers, another pioneer family on their way to Fairbanks. In 1928 the Creamers purchased the dairy from the Hinckleys and continued to develop, enlarge, and operate it until 1966. It was the largest and most successful dairy in Interior Alaska. Learn more about current farming operations. As the dairy grew over the years, migratory waterfowl congregated at Creamer's Field in increasing numbers. The grain and large open fields provided prime habitat. When the dairy went up for sale in 1966, the community raised money to ensure the farm fields were preserved so the birds would continue to stopover along their migratory route. The farm is now managed by the state of Alaska as part of the 1800 acres that make up Creamer's Refuge. The structures are the only surviving pioneer dairy buildings in Interior Alaska and were admitted to the National Register of Historic Places in 1977. 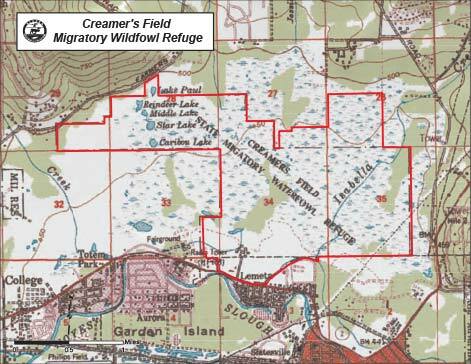 For more information on Creamer's Field State Game Refuge please refer to the Creamer's Field Management Plan (PDF 4,483 kB) and the Creamer's Resource Inventory (PDF 1,196 kB). For land status information, see the Creamer's Field Land Status Map (PDF 587 kB). Friends of Creamer's Field is a community-based, nonprofit organization dedicated to providing educational opportunities at Creamer's Refuge in cooperation with the Alaska Department of Fish & Game. Friends of Creamer's Field staff the Farmhouse Visitor Center, provide guided nature walks during the summer, and organize special educational events throughout the year. Membership forms and further information are available on location in the Visitor Center, by calling (907) 452-5162, or by visiting the Friends of Creamer's Field website. For current land status information, see the Creamer's Field Land Status Map (PDF 587 kB). You may also download the KML file which depicts the refuge area boundary.